Born the son of a carpenter of Culoz in south-eastern France in 1858, Léon Serpollet was the first to make an instant steam generator that worked effectively, although the concept of the 'flash boiler' was not new. Aged 19 he moved to Paris and in 1887 fitted such a device plus engine to a simple pedal tricycle. More substantial three-wheeled vehicles were made in 1889 but between 1893 and 1898 Serpollet concentrated on producing steam-powered trams. A wealthy American, Frank Gardner, financed the making of steam cars from 1899 and buyers included the Shah of Persia who owned several. Gardner-Serpollets were raced and sprint machines with streamlined bodies achieved some impressive speeds. Léon Serpollet died in February 1907 and the business with him. 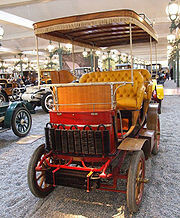 His cars were technically fascinating and they were the only European steam cars made in significant numbers. In recognition of the man and his work Serpollet's contemporaries erected a monument to his memory in the Place St Ferdinand off the Champs Elysées, where it can still be seen today.